This plugins helps you to create Aspose.BarCode Maven based project and tryout samples provided by Aspose. 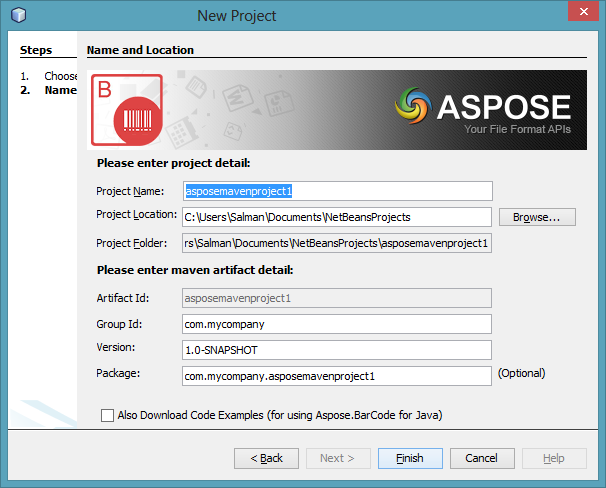 This is new Plugin for NetBeans IDE by Aspose This plugin is intended for developers using Maven platform for Java developments and want to use Aspose.BarCode for Java in their projects. 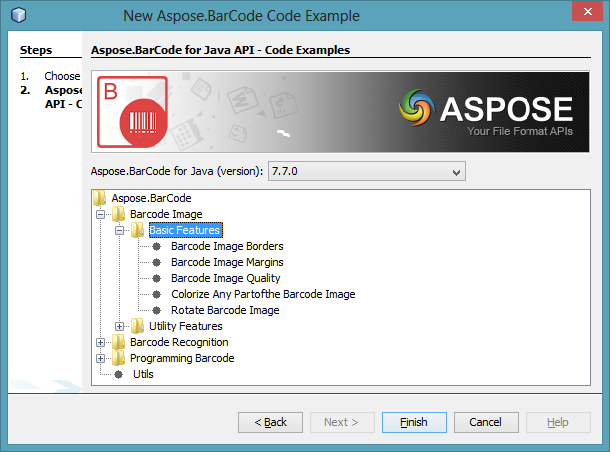 NOTE: Aspose.BarCode for Java is Java API developed by Aspose that enables Java applications to read, write and manipulate PowerPoint documents (PPT, PPTX, POS, PPS, POTX, PPSX) PDF, HTML and image file formats without using Microsoft PowerPoint. For the API detailed features list check the link. The wizard will also look for and updates for newly available Code Examples from Aspose.BarCode for Java examples repository. NOTE: Aspose.BarCode for Java is Java API developed by Aspose is a robust and reliable barcode generation and recognition component, written in Java, it allows developers to quickly and easily add barcode generation and recognition functionality to their Java applications. It is available for the Java SE, Java EE and Java ME platforms. For the API detailed features list check the link. What is Aspose.BarCode Java API? Aspose.BarCode for Java supports most established barcode standards and barcode specifications. It has the ability to export to multiple image formats including: BMP, EMF, GIF, JPEG, PNG, TIFF and WMF.